How does one diagnose an infectious flexor tenosynovitis (FT)? 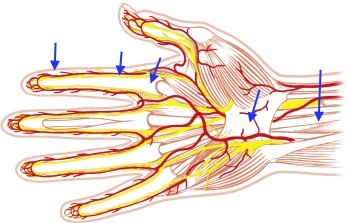 Does a lab test (hemogram) show a flexor tendon phlegmon? Can an infectious flexor tenosynovitis always be unequivocally confirmed? Along with the swelling of the middle finger and the metacarpus, one can clearly see the exposed flexor tendon. (The white spot in the picture is the flexor tendon of the middle finger). The back of the hand appears severely swollen even though the injury is located on the opposite side. At times it is easier to detect the severity of the infection in the associated swelling of the back of the hand rather than on the palm side of the hand. The oftentimes substantial stratum corneum (corneal layer) which can be found in the palms of the hands can inhibit the fingers from fully expanding. Is it necessary to take an x-ray to diagnose a flexor tendon phlegmon? An x-ray will not show a flexor tendon phlegmon, however, it may be advisable to still resort to one to exclude the involvement of a foreign body. Should the x-ray show a foreign body, it is important to include the removal of it in the surgical procedure. This x-ray of an inflamed child´s hand clearly shows the intruded foreign body (blue arrow). In a hemogram usually the white blood cells as well as the other inflammatory markers will appear elevated in case of a flexor tendon phlegmon. The lab tests therefore are very valuable to monitor the course of the condition. It is not easy at all to identify flexor tendon phlegmons in the early stage of the condition! In most cases it is indeed possible to do so beyond any doubt; especially if a preceding injury in proximity of flexor tendons occurred (regardless of how small the injury appears to be on the outside). In the early stage when the reddening begins and the pain increases, it could be difficult to confirm a reliable diagnose on a commencing infectious flexor tenosynovitis. In this case a very close monitoring of the progress of the condition is highly recommendable. Frequently the concerned patient is able to determine the severity of the condition even before the doctor can. (e.g. because of increasing throbbing night pains in the affected area).